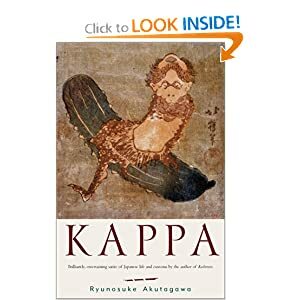 This is a rather odd choice for my first Japanese book review.... Kappa may not be a Japanese classic, yet it's author Akutagawa Ryūnosuke (1892 - 1927) is famous as one of the short-story authors of pre-WWII Japan. Kappa are Japanese river spirits or halflings (to misappropriate a Tolkein invention) that are famous for stealing children as well as their sexual proclivity. They are legendary figures of myth in Japan - and are known for their small primitive stature, lack of clothes and unusual saucer shaped depression on their head which must always be kept damp. Whilst primitive in external appearance however, they possess a deep culture and indeed can speak Japanese when they so desire. The book itself I would liken to a playful (and far less structured) Gulliver's Travels, with the protagonist recounting (whilst being visited in an institute for the insane) his adventure of finding Kappa-land one day. The short story is definitely satirical in nature, yet one can't quite pick the true target of that satire, with the bizarre Kappa-people both being the source of ridicule and yet also the measure of cultured sanity against which the Japanese are compared (and found wanting). In the story the protagonist having accidentally fallen into Kappa-land becomes a part of their society, forming many friendships with Kappa during his stay... he discovers many of the alien customs and culture of the Kappa. Not least bizarre is the trait of Kappa of being asked by the father (prior to birth) if they wished to be born. Should the foetal Kappa decide they did not want birth then there spirit is released... A peculiar fatalism that sees the unemployed Kappa being killed for food; and where music is all but illegal... not to mention a very strange criminal code... but to find out you should read the book. And it is this dark thread that pervades this story that is simultaneously light-heartedly nonsensical and yet cutting in it's dissection of Japan, or at least it's own creator. Akutagawa was indeed a troubled man, and an equally troubled author. His mother had become violently insane whilst he was a child, and as he grew to adulthood, it became increasingly obvious that he would share at least some of his mother's mental fragility. Whilst being on the vanguard of the new wave of Japanese authors (a strange combination of Western learned, yet deeply inspired by Japanese folklore) he never reached his full potential. With increasing hallucinations, introspection and fear that he would befall the illness that had struck his mother, he sadly took his life at the age of 35, the same year that Kappa was written. He left behind a wife and three children. Japanese literary history is replete with such sad, tragic stories. Perhaps his most famous book was Rashōmon, his second story. Interstingly, the Kurosawa Akira movie of the same name was apparently largely based on another Akutagawa story called, In the Grove (Yabu no Naka). Overall, I would say that Kappa will not inspire like Gulliver, nor will it leave you laughing at the jokes which I'm sure are centred too deeply in the Japan of the era. However, it's an interesting book and there's an interesting analysis of Akutagawa... who is intrinsically apart of each page of this book. In the book, once the protagonist manages to leave Kappa-land for the real world, he tries in vain to return. Despite being constantly visited by Kappa (whom no one else can see), in the end there is a sense of rapidly spiralling into insanity that was an all too real experience for the author himself. Check out Amazon or Borders (in Australia) for prices and more info... though I have to say, strangely enough it's cheaper to buy the english translations in Japan (1155 yen... about $14 AUD) than it is to buy them here in Australia ($29 AUD). That's one reason why I always buy stacks of books when I go to Japan. Language & Cultural Note: Japanese names - in Japan, family names come first, so in this case Akutagawa is the family name, and Ryūnosuke is the given name.